Did you know that the U.S. state that produces the most vegetables is going through the worst drought it has ever experienced and that the size of the total U.S. cattle herd is now the smallest that it has been since 1951? Just the other day, a CBS News article boldly declared that "food prices soar as incomes stand still", but the truth is that this is only just the beginning. If the drought that has been devastating farmers and ranchers out west continues, we are going to see prices for meat, fruits and vegetables soar into the stratosphere. 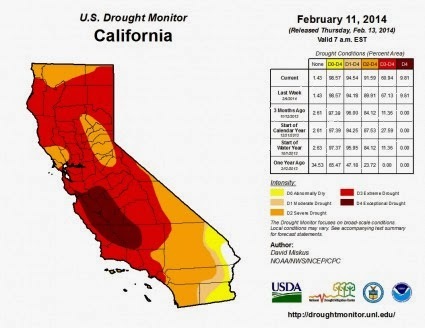 Already, the federal government has declared portions of 11 states to be "disaster areas", and California farmers are going to leave half a million acres sitting idle this year because of the extremely dry conditions. Sadly, experts are telling us that things are probably going to get worse before they get better (if they ever do). As you will read about below, one expert recently told National Geographic that throughout history it has been quite common for that region of North America to experience severe droughts that last for decades. In fact, one drought actually lasted for about 200 years. So there is the possibility that the drought that has begun in the state of California may not end during your entire lifetime.